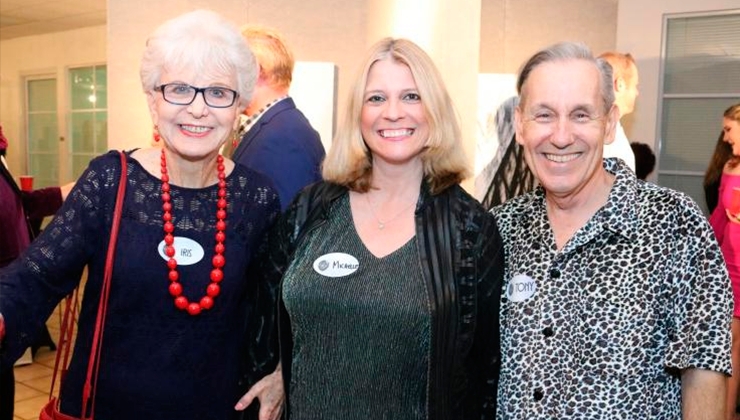 Iris Acker, Michelle F. Solomon, Tony Finstrom at the Silver Palm Awards. I can still hear Iris Acker's mellifluous voice when the phone would ring and she would say, "Michelle, I need you." The "need you" call was to appear as a guest panelist on her "Spotlight on the Arts" program on the Broward Education Communication Network (BECON-TV), as a fill-in for regular panelist, actress Karen Stephens. 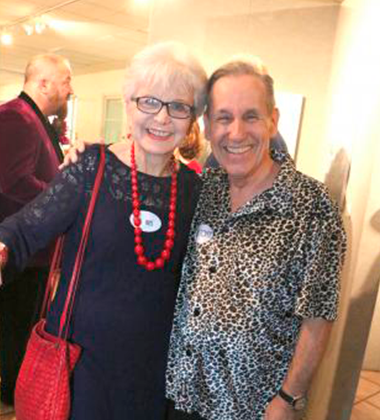 Acker would call me when Stephens was in rehearsal for a play, and couldn't devote a Monday to taping four of the "Spotlight" shows, a program which evolved from "On Stage With Iris Acker," which began on WLRN three decades ago. It had been on BECON since October 2013, and was a platform for area performing arts producers, publicists, directors, to talk about the state of South Florida arts, and, Acker's famous pitch that either she delivered or one of the panelists did, to make sure that her audience "goes out and enjoys live performance." I was more than happy to oblige to sit on her panel for so many reasons. For one, it was a chance to spend a day, not only on TV with Iris, but to be behind the scenes, helping her pick out a blouse, or talking about a show we had both seen at a local theater the weekend before. Iris Acker and Tony Finstrom. One of the best and luckiest days for me to be a panelist was when one of the guests called at the last minute to cancel. The panelists (the other two regulars are Bill Hirschman, the founder, writer and editor of FloridaTheaterOnStage.com, and Michael McKeever, playwright), and "Spotlight on the Arts" and BECON-TV director Mark Demeter, all put our heads together with an idea. Let's interview the grand dame of theater herself. I didn't even need to study her bio; I knew the questions I wanted to ask. I had known about her career; the names I had heard her drop. She was definitely fascinating, and an encyclopedia of theater and television. "You've built a reputation, and I love talking to you because you always have a wealth of names," I say on that particular "Spotlight" show. Watch The "Spotlight On The Arts" video featuring Iris Acker in the hot seat here. "I've been around a long time. I've been very fortunate. I had opportunities," she says. Acker arrived in South Florida from New York in 1974 with the play “The Marriage-Go-Round,” starring Julie Newmar. After appearing in “Plaza Suite” in Orlando and touring the state in “Minnie’s Boys,” Acker got her husband to agree to move here because she loved the Sunshine State so much. But, she told me, it came with conditions. She mentions it on that "Spotlight" show, in which I appeared. And, it was one of the highlights of her life here. “There's one thing, (my husband) said, you have to agree to live on a sailboat. We lived in Coconut Grove. I left a house in Bayside, Queens, New York. It was the ten happiest years of my life when we owned that boat. We lived on it for three, and then we moved across the street to a condo." Acker always had the perfect poise, but, when the time was right, she'd let her guard down. 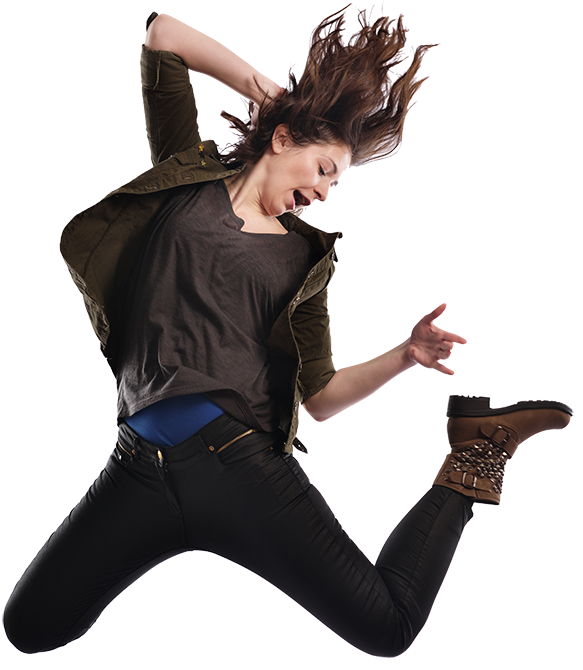 When the show "The Illusionists," a "how'd they do that?" presentation of magician-types, came to The Broward Center for the Performing Arts last June, audience participation was a big part of their game. It just so happened that Iris Acker was seated in Orchestra Right towards the front. 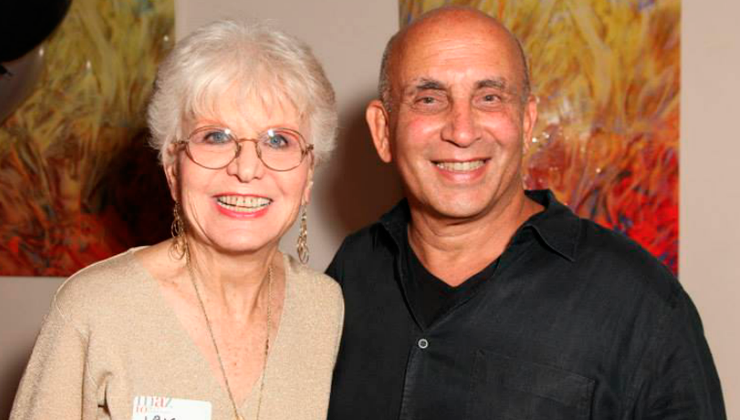 Iris Acker and miamiartzine.com founder and publisher Harvey J. Burstein. "Illusionist" Jeff Hobson picked Acker out of the crowd, and she willingly accompanied him on stage to perform a disappearing, then reappearing egg trick. If you didn't know better, you would have thought that this lovely woman from the audience was rehearsed, a plant, maybe? In my review I say this: "The hilarious chemistry that she and Hobson shared created priceless, comical moments. Hobson should consider taking Iris on the road with him." She had that kind of charisma. I called Acker a few weeks ago, just to say hello. I would check in with her every once in a while. She'd ask me how my 88 year old mother who is in an assisted living facility in memory care was doing. Always. She apologized that she would be out of town for my birthday in September, but she was going to London and Scotland. She would see me when she returned and we would celebrate. She added: "I will probably need you, Michelle." As a panelist for her show in October. "So, get ready." I was ready. Iris Acker and BECON-TV's Mark Demeter. We had only gone out to lunch once. Now, I wished we had committed to it more frequently as we said we were going to as we walked out of Lester's about six months ago. We picked Lester's Diner by Fort Lauderdale Airport. Not sure why. But it was fun, and we sat for hours. I thought perhaps she wanted to pick my brain about something to do with her television show, or something about local theater. She ask about how I got interested in theater, how did I enjoy acting when I did it, how did I like being a theater critic, working at television stations, and newspapers, where did I grow up, etc. It was all about me, really. We had known each other for about five years, we'd see each other at shows, or talk on the phone, but this was our first sit down. I waited for the professional question, the one where she was going to maybe pick my brain. I asked her, 'Was there something else about today? Anything you needed me to help you with?' As she scooped up the check and insisted to buy my lunch, she said, "No, there isn't anything else. I just wanted to know more about you." Iris Acker died on Sunday, Sept. 16, 2018. 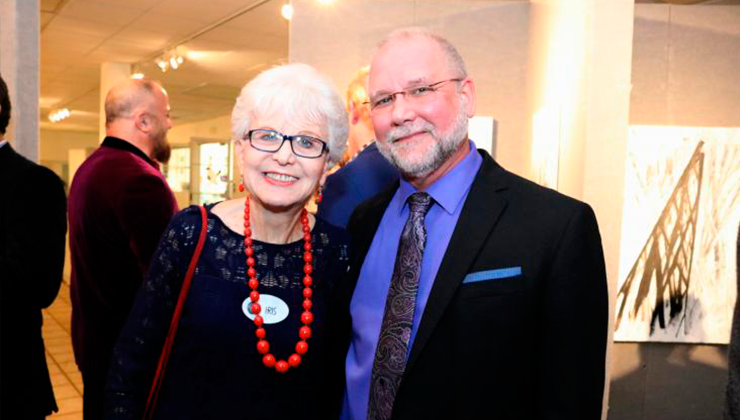 A “celebration’ of the life of Iris Acker has been scheduled for 7 p.m. Monday, Oct. 15 at The Wick Theater, Boca Raton. www.thewick.org. 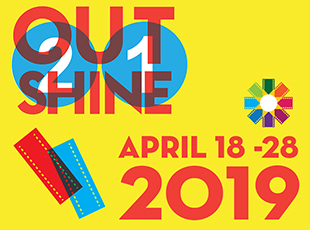 Contributions in her name are going to Sunrise Community, Inc. Questions about donations: Margaret Feldman, Vice President of Development (786) 314-6097 or (305) 273-3058.